Here's a little review of what we've been up to since the last time I wrote something. Last year was a big one for us with our farm store opening. This year will be even bigger as we are about to get a permit to sell our mead (honey wine) from the farm! We don't have any photos of the mead yet as I'm still working on the label designs. The photo at the top is of our hives ready for winter. 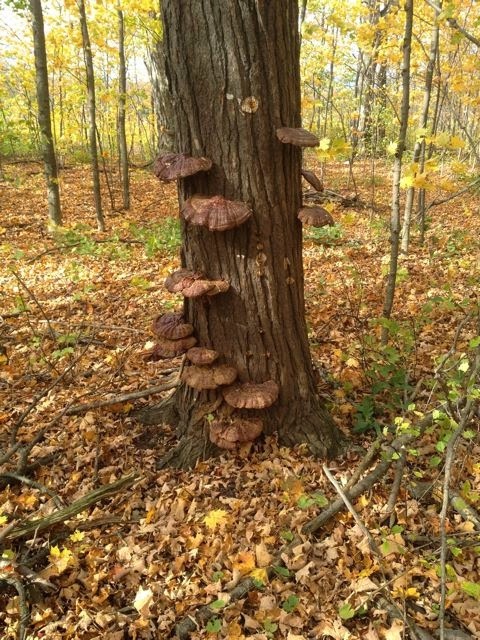 We were walking in our woods in the fall and were so excited to find this tree covered in reishi mushrooms! This medicinal fungus (ganoderma lucidum) is used in traditional Chinese medicine as an anti cancer treatment. It is said to stop the growth of tumors. This is a woody type of mushroom with a shiny red surface, in the polypore family. The ones growing on our tree were past their prime and not usable but the fact that they are there is encouraging. We will have to check back in the coming year for new growth. We did the One of a Kind Christmas show again this year. It was a great success and we had fun with our fellow crafters. 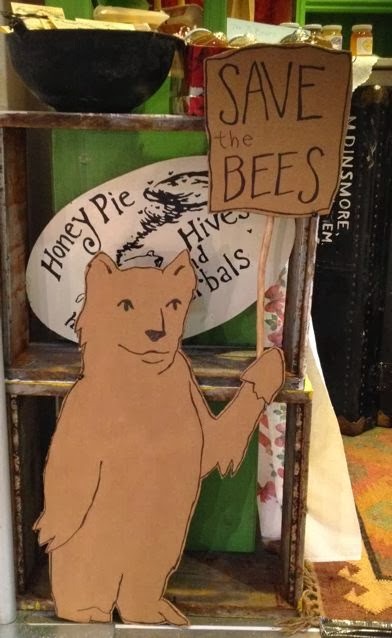 I made this bear for our booth to help get the conversation started with people about what's happening with the bees. People are concerned and so are we. I think it's important to remember that this isn't an isolated event. The use of pesticides has been going on since World War II and people have documented the damage they have done to the ecosystem from frogs to birds to humans. The class of chemicals that people are upset about now are called neonicotinoids. They are considered more serious than other pesticides because they don't break down in the environment. They have been found to kill large numbers of honey bees as well as cause secondary poisoning such as interruption of egg laying. These chemicals are used on field crops like corn and soybeans but also on plants that are sold to gardeners for home use. You may have gone to a garden centre to buy flowers to attract bees and brought home the very thing that poisons them. If you'd like to sign a petition to save the bees, the Ontario Beekeepers have one here. 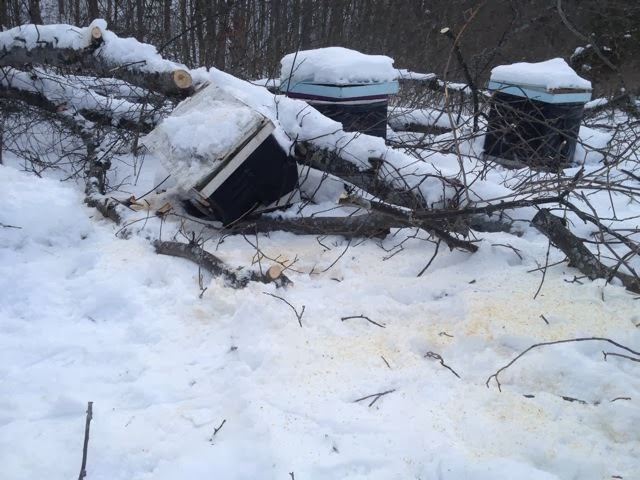 During the big ice storm this tree fell on some of our hives. One of them was destroyed and the lids of two others were damaged. The weather has been very cold for the bees but the blanket of snow on the lids helps insulate them. You can see in the photo that the hives have a black covering on the sides. This is a bubble wrap insulation jacket that we put on for the winter. Honey bees, like all insects, cannot move when the temperature drops below 10 degrees C. They stay inside the hive and generate heat by buzzing. Their mission is to make sure the queen survives the winter so they form a ball around her and keep her in the centre. When the bees on the outside edges of the cluster get cold, they burrow in towards the centre to warm up. We took so many beautiful photos of the ice covering everything. 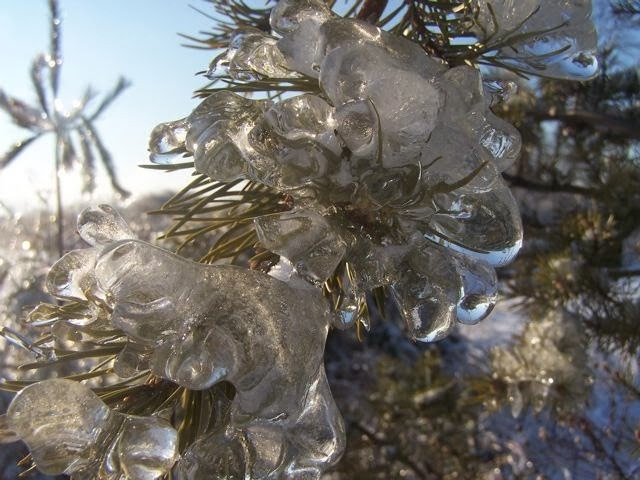 I like how this one on the pine branches looks like ice flowers. 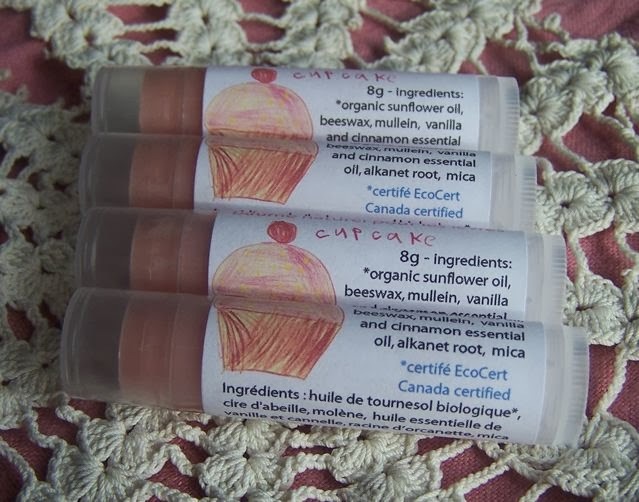 Our 7 year old daughter, Hazel, decided to make her own lip balm to sell. It's pink and sparkly and cupcake flavoured! We used vanilla and cinnamon essential oils for the flavour. She drew the cupcake for the label herself. We're putting a portion of the profits in her education savings account. Here's a photo of Gavin and his beekeeping class last summer. He's offering the class again this year for the third year. We offer a discount for those who sign up for the class by Feb. 15. Click here for more details and here for the Facebook page.